Supercharger is right. 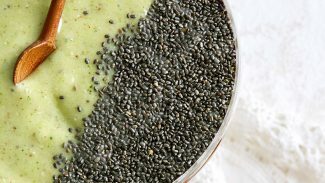 This smoothie packs in protein from chia seeds, almond milk, almond butter, and kale, which makes it a perfect go-to before or after a workout. I love the combination of ginger, mango, and almond—it tastes decadent but fruity and uplifting at the same time. Pro tip: If you don’t have mango, substitute pineapple or extra banana instead. Or, for a very different—but also very delicious—blend, try swapping blueberries for mango.